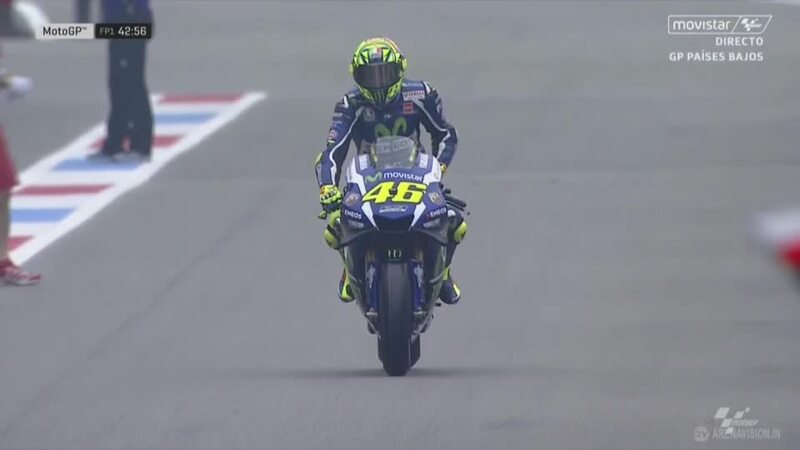 The rain held off as the premier class had their first run at Assen with Michelin tyres, Iannone fast from the off. 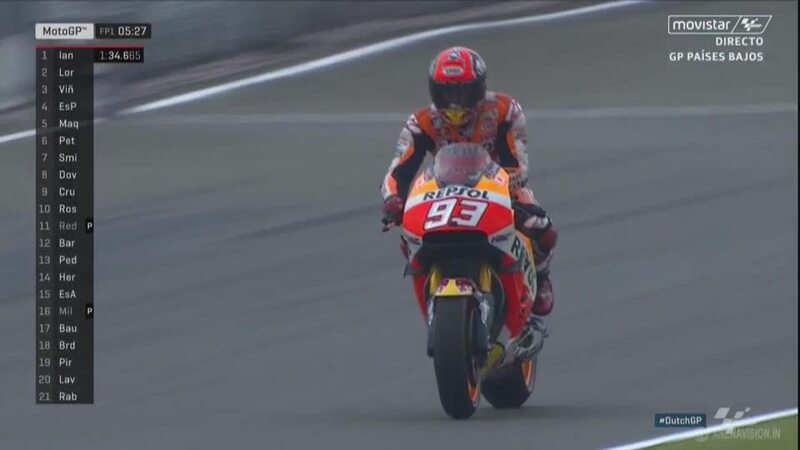 Despite spits of rain during the Moto3™ practice sessions earlier in the day, many of the MotoGP™ World Championship riders headed out on slicks to assess the TT Circuit Assen. Riders and teams quickly settled on slick tyres, with rain predicted for much of the weekend Free Practice 1 could decide who advances into Q2 directly. 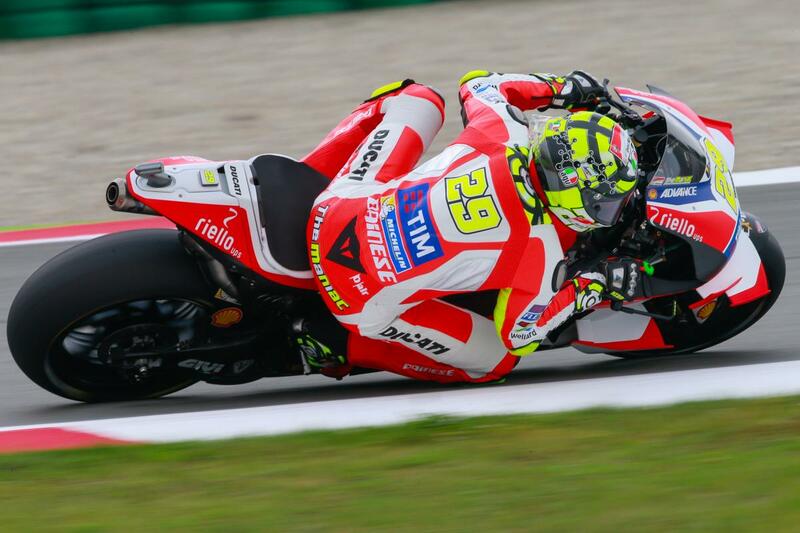 He’s set to start from the back of the grid on Sunday, but Andrea Iannone (Ducati Team) was immediately fast. 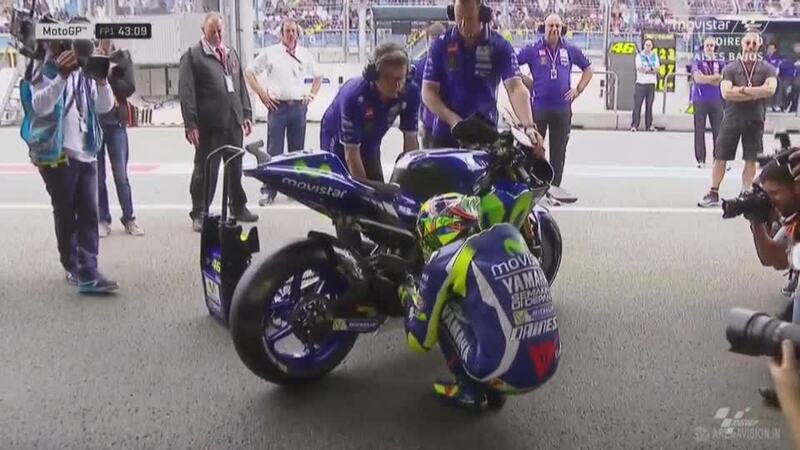 The Italian set a 1’34.349 to top the session, able to produce a string of fast and consistent laps. 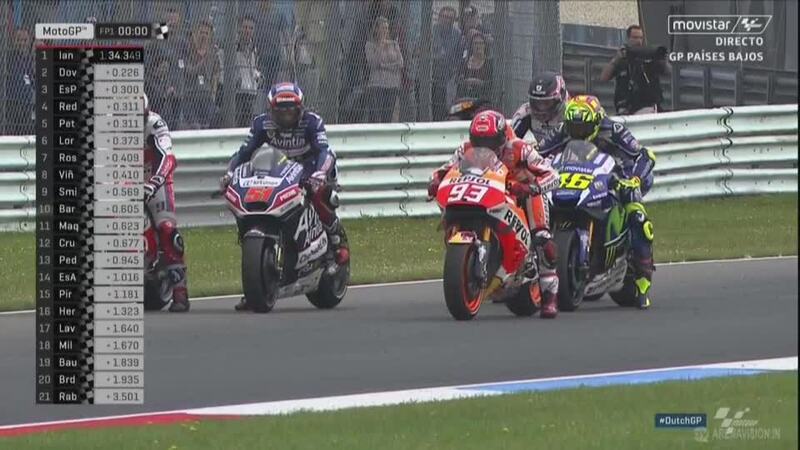 He had to push hard at the end as a number of riders launched a late assault, but Iannone responded. Andrea Dovizioso (Ducati Team) proved the Ducati was no slouch around the Dutch track, ending 0.226s behind his teammate to make it a Ducati one-two to start the day. Both Dovizioso and Ducati have a strong history when conditions aren’t perfect, ones to watch. Third place went to Pol Espargaro (Monster Yamaha Tech 3), the only non-Ducati rider in the top five. 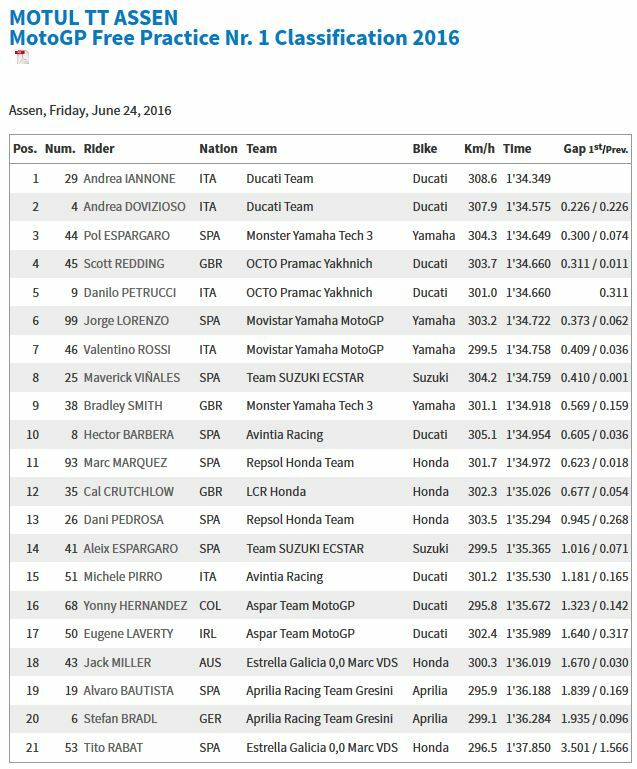 Times at the top were tight with Espargaro only 0.3s behind Iannone. 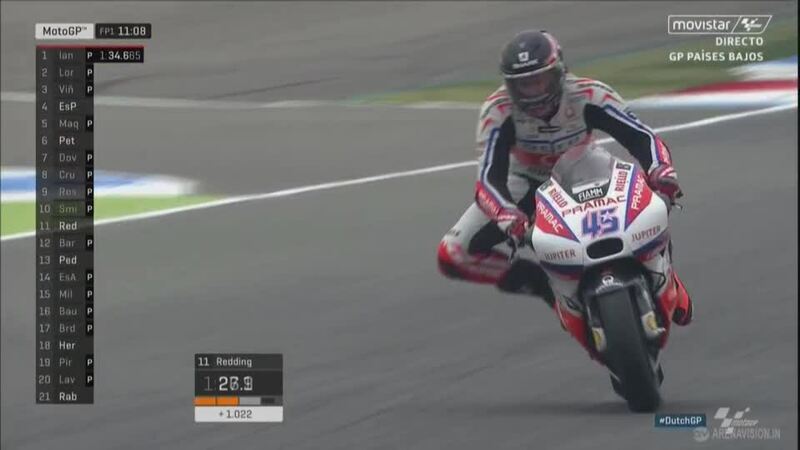 In fourth and fifth, teammates Scott Redding (Octo Pramac Yakhnich) and Danilo Petrucci (Octo Pramac Yakhnich) set identical times of 1’34.660. 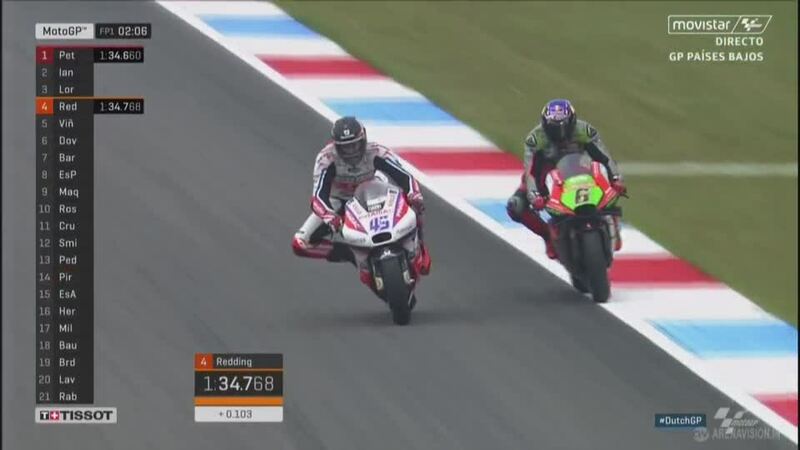 Redding was granted fourth as his second fastest lap was better than Petrucci’s. 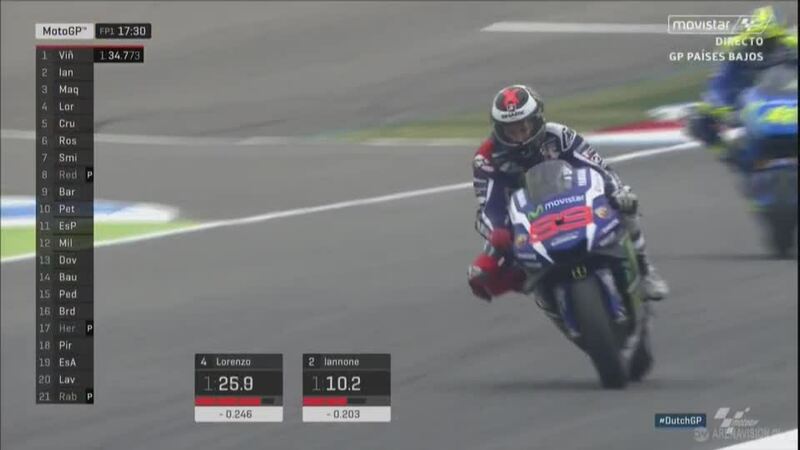 Jorge Lorenzo (Movistar Yamaha MotoGP) and Valentino Rossi (Movistar Yamaha MotoGP) managed to drag themselves inside the top ten to ensure passage to Q2 should the rain hit. 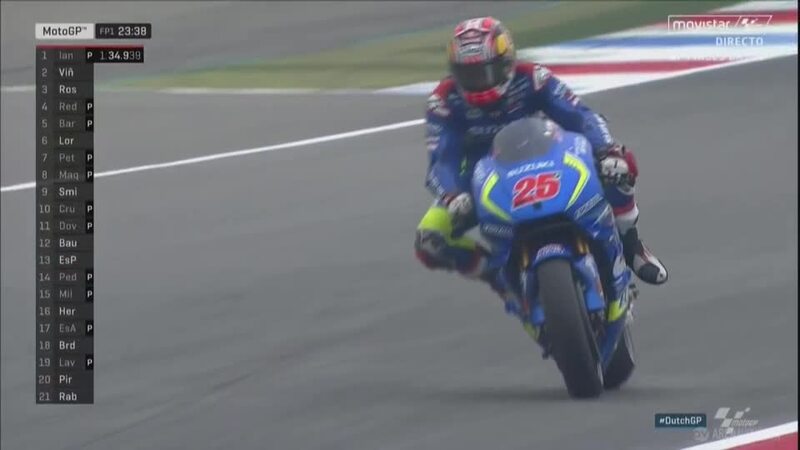 Maverick Viñales (Team Suzuki Ecstar), Bradley Smith (Monster Yamaha Tech 3) and Hector Barbera (Avintia Racing) were all within 0.605s of Iannone and inside the top ten. 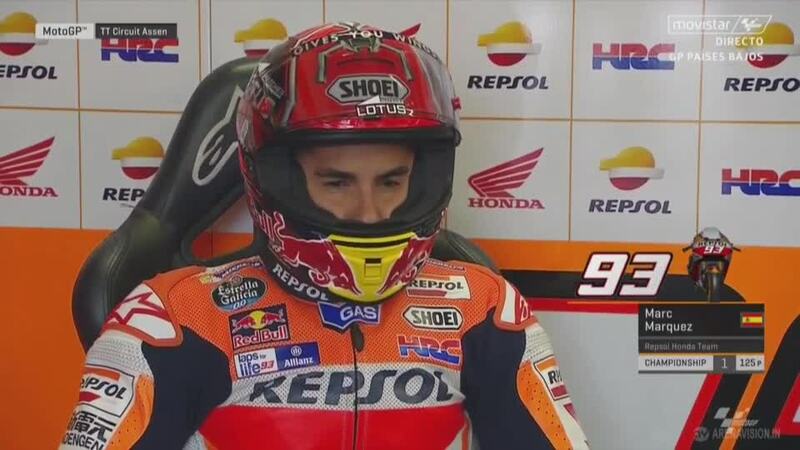 Both Marc Marquez (Repsol Honda Team) and Dani Pedrosa (Repsol Honda Team) finished outside the top ten in 11th and 13th respectively.